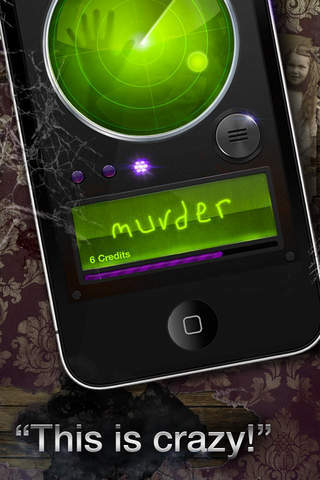 Grab your phone and let's go Ghost Hunting!!! "There's an app for that" right? Well ghost hunting is no different. Do I think that ghost hunting apps work? Well, if a ghost can throw a glass across the room, and communicate through other electronic devices then why couldn't they manipulate our phones??? It's an electronic device, right? I do believe some may be useful and some are nothing more than amusement. 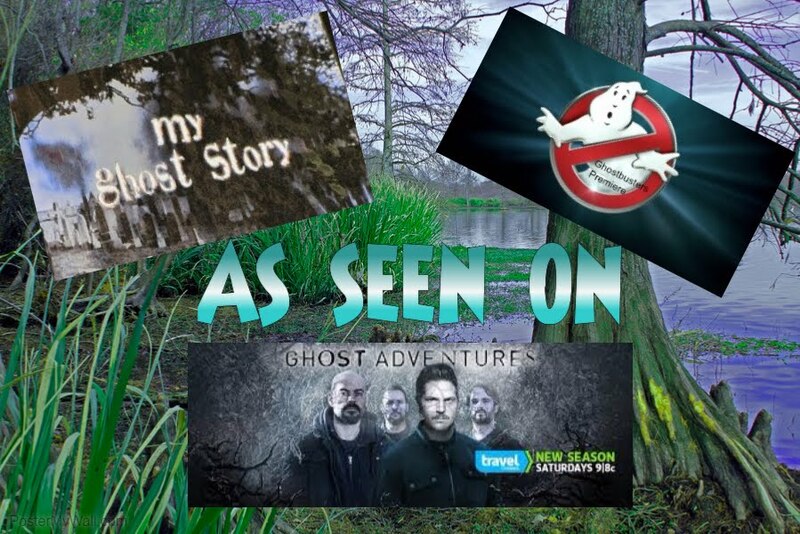 Are you looking for something "just to have a little fun" with or are you wanting an app that might actually come in handy while ghost hunting? Well, your in luck...there's both. There are ton and tons of apps strictly for entertainment purposes only (although almost all the apps say that). You can scare the crap out of your friends with these apps. Then, there's the apps that might actually work. I am constantly playing with apps and testing them to see which ones work and with ones don't. **My two cents-This is probably one of my favorite apps. I have found it to be "spot on" in some locations when investigating. It is very easy to use and has different screens for you to watch as well as keeping a log of all the EVP's you collect so you can go back later and review your evidence. The VERY FIRST TIME I turned on the M2, it said "Rebecca" witch is my name....Becky is short for Rebecca. Are you kidding me!!!!! Give this one a shot! Ghost Hunter M2 was developed by professional engineers, and is said to be the most advanced paranormal investigation toolkit in all known and unknown universes. 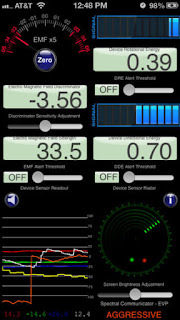 Ghost Hunter M2 features an EMF instrument measuring magnetic fluctuations with the magnetometer of your Apple device, an Audio Detection Instrument and a Fast Fourier Transform Visualizer analyzing complex audio signals (meaning other-worldly shrieks sending shivers down your spine), a Geoscope magnifying terrainial and sub-terrainial fluctuations so that you can spot zombies trying to sneak attack you by bursting out of their grave, a Spatial Displacement Instrument analyzing the data flowing in from the assortment of the app’s electro-mechanical sensors, a Twilight Instrument turning your Apple device’s camera into an all-seeing eye, an EVP (Electronic Voice Phenomena) Instrument delivering bone-chilling spirit voices in both audio and visual format, a Luxscope capable of measuring the most minute changes in the environment’s illuminance, and a Barometer. It very much seems like we’ve kicked things off at the top of the heap, because Ghost Hunter M2 is the undisputed non plus ultra of paranormal investigation toolkits, all the while costing only 99 cents. ***My two cents-This is also a really good app. Again, very easy to use and it also stores your EVP's which is always a plus. It has a good clear "voice" that announces the words. 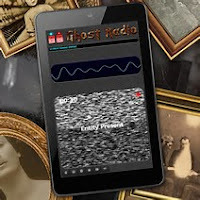 Ghost Radar: Legacy is a spruced up, refined version of Ghost Radar: Classic, a straightforward paranormal app with a simple, functional design. Ghost Radar: Legacy does what its predecessor did: it detects paranormal activity by gathering and analyzing a wide range of data – though it performs its manifold functions at a much higher level, with greater efficiency and precision, and with more style thanks to the fully revamped interface. Ghost Radar: Legacy is capable of translating energy into graphics, words, numeric values, and radar indicators, ensuring that no nearby spirit will slip away unseen. Based on the reviews we’ve read on the AppStore, being daring and curious might uncover bone-chilling secrets – but those secrets are the exact sources of the ecstatic terror each and every paranormal investigator is yearning for. Or maybe most of those reviews are nothing more than clever marketing tricks, who knows. When it comes to ghosts, the answer is never clear. ***My two cents-Not impressed myself but others seem to like this app. Sorry, I just don't think it is the "real deal". But you decide for yourself. ***My two cents-This app is probably the app that has scared me the most!!! It has either a creepy lady's or man's voice that comes across and announces the generated word very slowly. I caution you with this one...it seems that when I have tested this it seems to "attract" the more evil or demonic spirits. At one point a friend and I were using it and it got so crazy and so actuate that we had to turn it off. And at one point, I even took it off my phone. But, I couldn't resist....I had to put it back on. Electronic Voice Phenomena (EVP) is the collective name for the sounds sometimes detected on electronic recordings and reminiscent of human speech. These sounds are usually found in recordings with noise or poor radio reception, and is considered by many to be the voices of paranormal beings such as ghosts, spirits, demons and other energy based entities. EVP is a form of Instrumental Trans-Communication (ITC), a term coined by professor Ernst Senkowski in the 1970s. 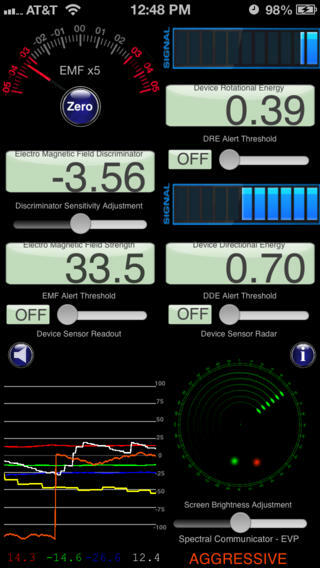 This app has taken the traditional ghost box to the next level, and also incorporates an EMF (Electromagnetic Field) scanner. As with traditional ghost boxes, chaotic noise seems to be both inviting and sensitive to paranormal manipulation. The app generates audible speech by detecting meaningful phrases and words together with properties such as gender, age and current mood of the communicating entity. We continuously improve the app, based on user feedback, and use it during our own paranormal investigations as well. ***My two cents-This little app is really fun. It comes up and "writes" creepy words. The only problem, there is no beep or anything that notifies you that a word is about to be written and it only stays up a couple seconds. My suggestion....screenshot the words as soon as they appear. That's what I do anyway. Then you can review them later. Do I think it really helps on investigation? I think it is probably more for fun. This app uses sensors and analytical information to create an interactive paranormal experience. A small radio screen detects spirits and at the bottom words are generated and spelled out. ***My two cents-This is another fun one. 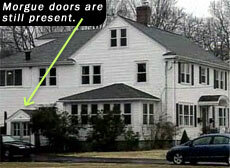 It has a funny little beep when a spirit is detected and a clear voice when it captures EVP's. One thing, it does not store the words to review later.